We would support you to seize on every business opportunity, and not miss any beneficial information that's related to you. XAVi Technologies Corporation has relocated its Taipei office to Chicony's brand new high-rise for a year. At 22nd floor, this Smart and Green building offers a great environment for XAVi to better serve its customers with innovation, quality and satisfaction. XAVi XGS-PON 10G/10G BOB HGU sample now available. Taipei, Taiwan, November 2, 2016 - XAVi Technologies Corporation, a leading CPE provider for Broadband Access and FTTx, starts volume shipping of its G.fast products. 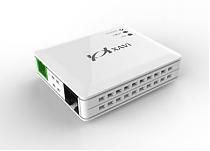 XAVi Technologies will join UNH-IOL (InterOperability Laboratory) this year for GPON ONT interoperability test with major OLTs.